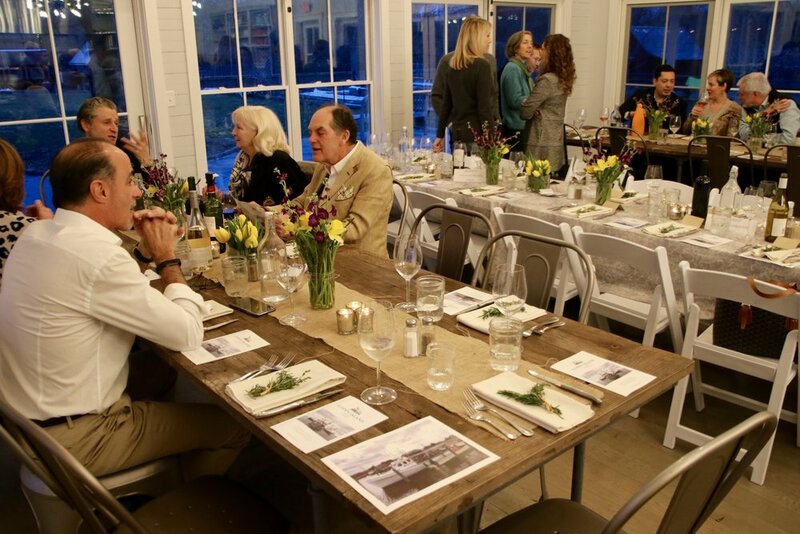 Last week I had the privilege of attending a truly wonderful and informative dinner at Wakeman Town Farm on the importance of sustainable seafood. 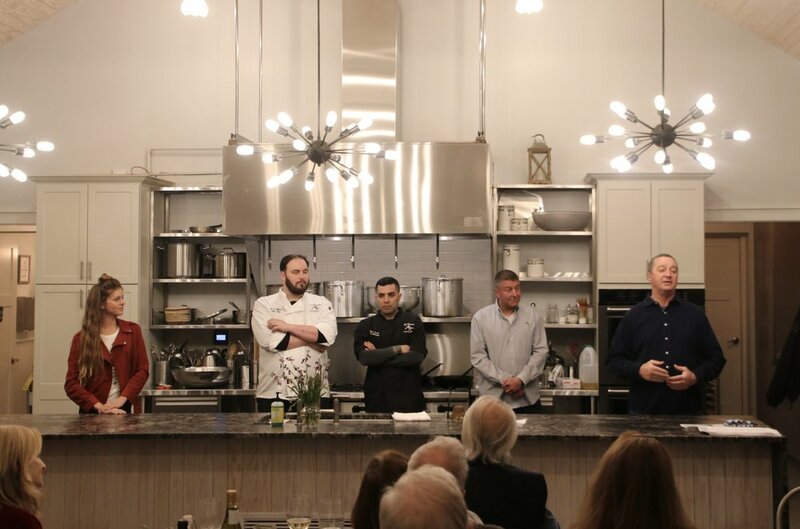 We first heard from Norm Bloom of Copp’s Island Oysters, followed by Kevin Conroy, owner of The Restaurant at Rowayton Seafood and the Rowayton Seafood Fish Market. He was joined by Chef Charles Hoffman the restaurant’s executive chef who prepared a most memorable meal. The Blooms have been in the oyster business since the 1940s and currently operate one of the last standing traditional oyster farms in the United States. Norm Bloom and Son is a fourth generation family-owned farm that prides itself on high quality, consistent and sustainable products. They have a fleet of 15 boats and their dedicated crew harvests oysters and clams year round from the deep, cold, and nutrient-rich waters along the coast of Connecticut. Norm Bloom and Son’s commitment to providing sustainable products begins by maintaining, preserving and monitoring the waters of the Long Island Sound. Additionally, they employ farming techniques that enhance the environment needed for oysters to thrive. These methods have successfully increased the production and quality of our oysters in local waters for over 150 years. The Connecticut side of the Long Island Sound is an ideal oyster hatching habitat due to the rivers which bring nutrients into the water and by causing natural currents which helps water to flush faster and more frequently. 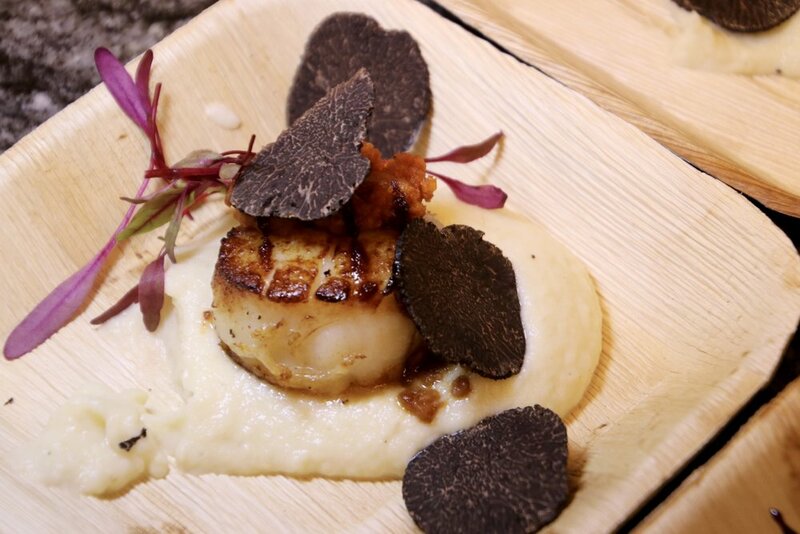 Their sustainable farms not only produce the most delicious treats but are incredibly beneficial to our environment. Their oyster beds act as a natural filtration for millions of gallons of water each day and create habitats for many other varieties of marine life. With over 12,000 acres in Westport, Norwalk, Bridgeport, and New Haven, and have partnered with smaller farms in Noank, Mystic and Delaware. It should be no surprise, therefore, that Copps Island Oysters would appear on the menu at the Restaurant at Rowayton Seafood and at their fish market located just across the street. I’ve been a longtime fan of the restaurant, its delicious fare and its breathtaking views, and I find it reassuring that they support the sustainable seafood industry. Since 1996 the family run restaurant has been a longtime favorite in the community and beyond. Tucked alongside the restaurant, Rowayton Seafood Market resides in an old fishing shack that was once the oldest operating Lobster Co-Op on the Long Island Sound. The restaurant and the market have partnered with the Monterey Bay Aquarium and the Seafood Watch Program to serve sustainable seafood in an effort to support healthy oceans and promote species regeneration. Conroy spoke about the importance of sustainable seafood. What exactly is sustainable seafood? It’s a term for collecting fish, mollusks, and shellfish ensuring that enough fish have been left in the ocean, that their habitats are being maintained, cared for and replenished and a means of raising and catching these water-dwellers that won’t negatively impact their environments and livelihoods. As we learned all about the positive impacts of seafood sustainability we noshed on some of the delicious items prepared for us. We began with Oysters with Mimosa Gelée and a fresh fennel frond which accentuated the sweet and salty brininess. 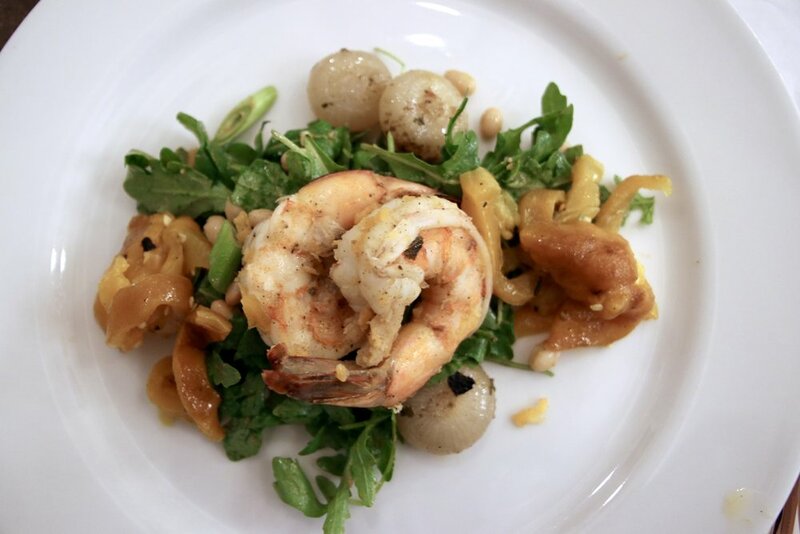 From there our Braised Shrimp Salad with arugula, scallion, white beans, fire roasted veggies and with a tomato vinaigrette was followed by a Smoked Jumbo Bea Scallop served over a celery root puree with chorizo, a cherry gastrique and freshly shaved Perigord Truffle. The Baramundi en Papillote (Sea bass in parchment) was accompanied by organic parsnips, spring onions, and a saffron sherry butter. What good is a meal that doesn’t end on a sweet note? The Moro Blood Orange tart with a graham cracker crust was served up with a sweet fennel ice cream, a delicious ending for a truly unforgettable meal. When shopping for and ordering fish when dining out there are best choices, good choices and those that should be avoided, as listed below. I look forward to attending many more events at the Wakeman Town Farm, and many more meals at Rowayton Seafood. For information on all mentioned in this article, please click on the links provided for you below.